Rapper Kendrick Lamar performs during half time during 2018 College Football Playoff National Championship Game at Centennial Olympic Park on January 8, 2018 in Atlanta, Georgia. Lamar recently shut down one of his own fans for reciting lyrics from one of his songs. 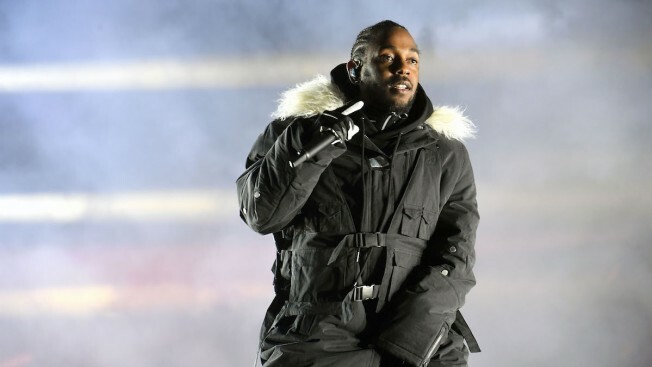 Kendrick Lamar, the multi-talented rapper who who recently broke new ground winning a Pulitzer for his work on the album Damn, had to remind a white fan to mind her words during a recent performance in Alabama after she repeatedly dropped the N-word on stage. Lamar invited a young woman identified as Delaney onstage during his set at the Hangout Festival in Gulf Shores, Alabama on Sunday. Editor's Note: The video contains language some may find objectionable. The two were rapping to his song m.A.A.d city when the fan said his full lyrics which included the N-word. After the crowd began to react Lamar cut her off. "You gotta bleep one single word though," he said before turning to the crowd asking, "Should she stay up here, y’all?" Many of the concertgoers can be heard yelling, "No!" Despite the crowd’s reaction Lamar allowed the fan to continue with him on stage.